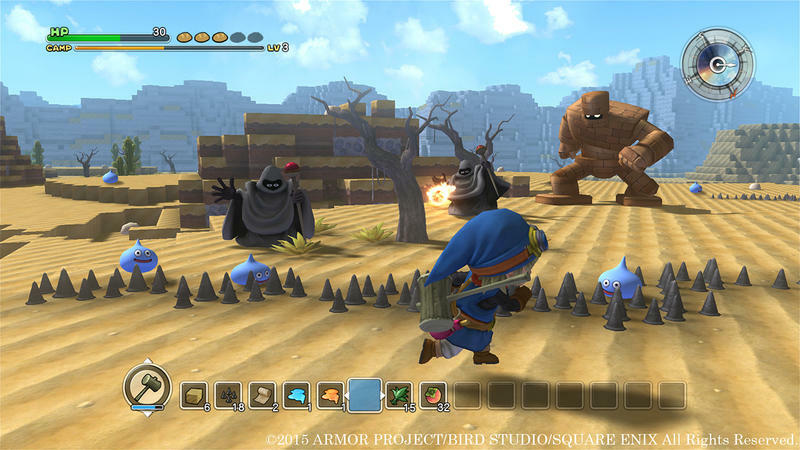 Dragon Quest Builders demo impressions - One of the most addictive game of 2016? The last time a Dragon Quest title was offered for free in North America was back in 1990, when Nintendo, unable to sell the idea of the game through Nintendo Power, actually gave it away for free to its readers! No strings attached, here’s a free game! See what it’s like yourself! At that time, the game was already four years old, and despite a face-lift for the North American market, it was leagues behind what stars of the NES like Konami and Capcom were cranking out. Final Fantasy hadn’t been released yet, RPGs were still half a decade away from being remotely recognizable in the States, and, needless to say, the North American gaming audience did not catch on in the same way that it had in Japan. Nintendo tried and tried to make the RPG happen in the United States, but it wasn’t until its successor console, the Super Nintendo, did players finally start to realize the magic that the genre offered. 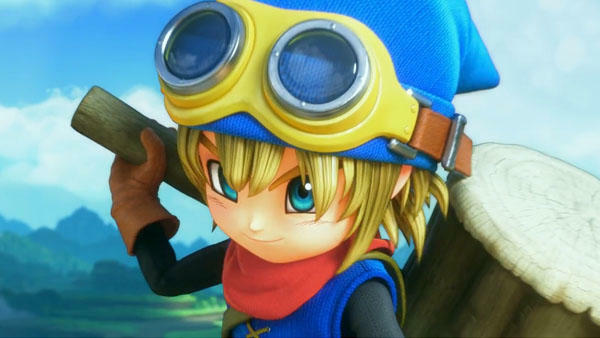 By that time, it was too late for Dragon Quest, and Enix had pulled out from the North American market during the franchise’s most sentimental years. 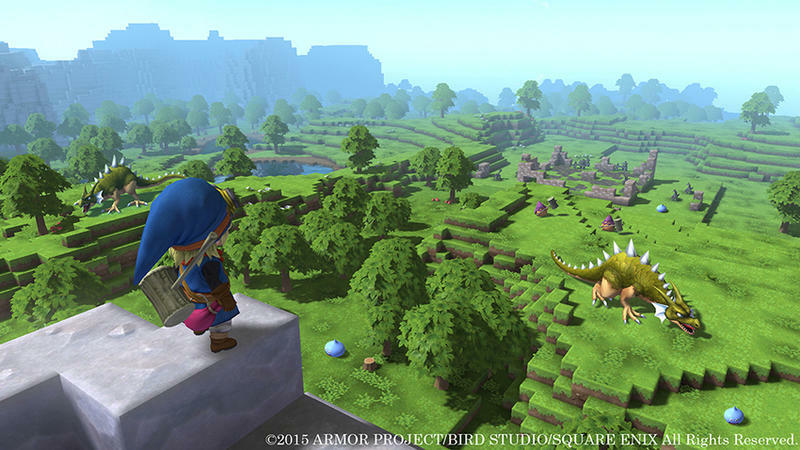 25 years later, Square Enix is now offering a free look into the PS Vita and PlayStation 4 game Dragon Quest Builders. Because if an excellent, classically stylized JRPG is not the way to reach the younger generation’s heart, then by all means, why not a Minecraft clone? Those element blocks on the cover are sure to sell a few hundred copies around the country and plant the Dragon Quest name in a few brains along the way. That’s one way to look at Dragon Quest Builders. I’m coming from a different angle in that I have yet to be swept up into the whole “building” genre of gaming. Likewise, as a Dragon Quest fan, I am right on the front lines with the rest of them, demanding that the series has more representation in the States. Dragon Quest Builders is a two way street, open to both veterans and newcomers of both the Dragon Quest franchise and building games. An introductory course to these two very different styles of games, and a pleasant experience for those who are already established in one or the other. 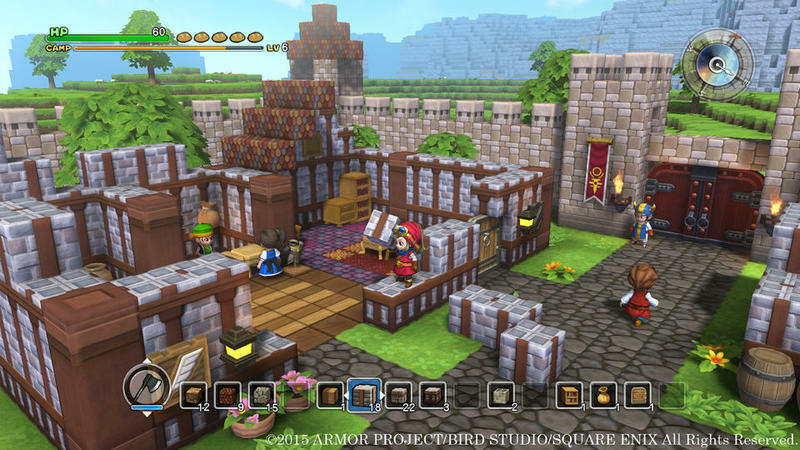 To say that Dragon Quest Builders is a straight up Minecraft clone, though, would be a disservice to all that Square Enix has accomplished with this excellent little title. Such a misnomer blatantly disregards the decades of lore crammed into this game, and, not to mention, the effort Square Enix actually goes to introduce, step by step, how to go about building. For as long as Dragon Quest has existed, the series has already been at the forefront of accessibility. Even the first game was an attempt to simplify the pesky, complicated RPGs from the Western world like Ultima and Wizardry for young, Japanese audiences. In the demo now available on PlayStation Network, I played it on the Vita, that spirit of accessibility lives on. This demo most likely serves as the actual game’s tutorial mission. Our story begins where the first Dragon Quest ends. Only, instead of opting to save the world, the hero sides with the evil wizard and helps conquer civilization. Now, humanity is in ruin, and the world lies in shambles. The Almighty, Dragon Quests’ deity, awakens a single lad from the grave and grants him with a lost art only known as “building,” unknown to the humans of this land. After escaping his tomb and setting out upon the world, the young man finds an abandoned village and a young girl who wanders in from the wilderness. Square Enix uses the demo to educate players step by step how to build tools, gather materials, construct houses, and even gather experience points through the girl’s requests and The Almighty’s advice. It might seem like elementary to veterans of Minecraft, but to me, it’s a life-saver! 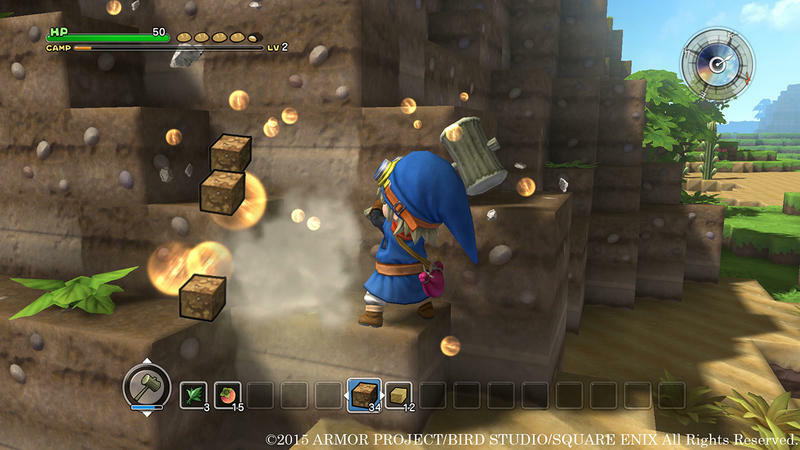 Dragon Quest Builders even gives a much needed helping hand with the aid of blueprints. Not all of us are naturally gifted engineers, so even the smallest aid in how to lay a basic foundation goes a long way to sparking our minds. And yes, I mentioned experience points. 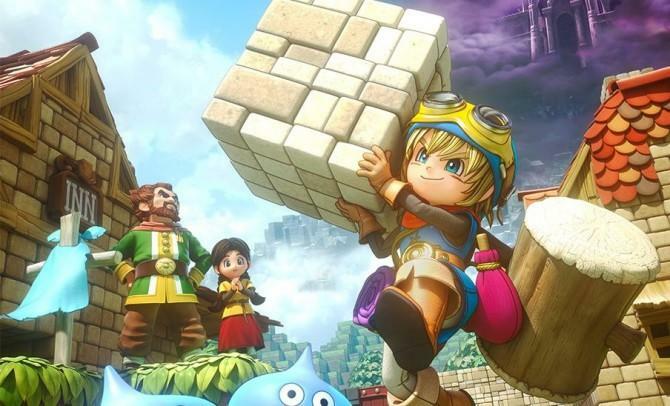 Dragon Quest Builders is still an RPG at heart despite its connections to the Minecraft, and it is these mechanics that ultimately set it apart. Unlike Minecraft, where the materials to build entire empires are available right from the beginning, our player needs to earn new materials and schematics to expand his knowledge. Build a house, fill it with lights and beds, construct a storage chest, complete the blueprints for a workhouse, complete quests, find new villagers to populate the town. All of these actions will give players points, and with these points, newer building abilities and ideas trickle in at a much slower pace. Again, this is a much needed steady flow of information for those of us who have seen the majesty of Minecraft and are immediately intimidated and turned off by the scope of what is available right away. I would much rather build up my skills at a steady pace, and that’s where the accessibility of Dragon Quest Builders comes into play. And can I say that I am proud of Square Enix, the company behind the monstrous Final Fantasy XV, for showing a little restraint in releasing a demo that is only 590 MB! The PS Vita version is only 255 MB! Further Dragon Quest elements besides the accessibility are all found in the aesthetics. Each of the elements that the protagonist (I can’t say “hero” because The Almighty explicitly says “You are not a hero” in the dialogue) picks up are items found in the main games, like the Cyprus Pole, the Wooden Club, and the Seed of Life. Traditional monsters like Slimes, Drakys, and Golems all pop up for a spell, and the player will have to fight them off with the one-button combat to defend the village, gaining experience points in the process. And Dragon Quest just isn’t Dragon Quest without a classically orchestrated soundtrack. It feels so natural in this Minecraft-esque world. The game controls adequately, but I would say it falls on the stiff side. Dragon Quest is infamous for sticking to tradition by all means necessary, and that is the case here as well. The X-button brings up a menu, which is okay in a normal RPG but totally weird in an action game since that is typically the jump button. The square button lays the elements, which is usually used for attacks. Triangle attacks with weapons, but it is usually used for special abilities. Circle jumps, and that is usually a dash or secondary fire button. Needless to say, Dragon Quest’s controller traditions, which date all the way back to the 80s, are bound to confuse newcomers in this modern day action action game. The PlayStation 4 version runs infinitely smoother, and I still wrestle with dual-analog on a PS Vita. Having a screen between my thumbs just doesn’t register the same way, same with the Wii U. But as for the game itself, I can already seem myself getting totally addicted to it. The second I completed my first blueprint and found my second villager, I thought… “I need to play more! More blueprints! More buildings!” This is weird because I usually avoid building games, looking at you Fallout 4! But all it took was the Dragon Quest brand name and all my usual emotional triggers. Akira Toriyama artwork, slimes, RPG progression, whimsical music, wow… this makes sense to me now! A whole new world, and I might even try Minecraft out after wrapping this up! Likewise, Minecraft fans should give this a look. It might seem somewhat restricting with the size and objectives, but it’s those objectives which set this apart and make it feel more like a genuine game than a limitless sandbox. Maybe giving your Minecraft experience purpose is a good idea for a change. And who knows? Maybe you’ll even be turned on to the Dragon Quest series in the process thanks to this wonderful little game. That’s the circle of accessibility, and it just keeps spinning. You’ll be a convert either way after playing this game, or at least the demo, but it goes without saying that this has a better chance of spreading Dragon Quest to kids than the original game did through the aid of Nintendo Power.